Before I ever came to Chicago, Chicago came to me, with all its sweet ethnic pride, in the form of Maurice Lenell cookies. I didn't know it, at the time, that these small, sugary emissaries, marching by the millions from their Harlem Avenue plant, were a lingering remnant of the city's vibrant Swedish community, along with Andersonville, Peterson Avenue, and Walgreen's. A remnant that will fade out of existence now that the brand has been shut down by its owner, Consolidated Biscuit of Ohio. No more almonettes. No more raspberry jelly swirls. No more—sob!—pinwheels. Of course there was always more to Maurice Lenell than just cookies. They had the crinkly red paper nest the cookies sat stacked in. The distinctive logo, a lucky boy who had somehow contrived to find a cookie jar larger than himself and climb inside. The cookies were all of a size, about a half dollar, came in two dozen varieties. Not that the varieties were equal: there was a hierarchy. At the bottom, the Chinese almond—boring. Next, the chocolate chip -- always a disappointment, never really very chocolate chippy. Better were the hexagonal cookies topped with coarse sugar, and the raspberry jelly swirls, with their tongue-pleasing ridges and glob of red goo—they might call it "jelly," but it was hard, and would embed itself in your molar to be picked out with a fingernail. And the empyrean, the best-selling pinwheel. A dense disc of sugar, swirled chocolate and vanilla, with an improbable pink trim. They spelled cookie "cooky," "The Maurice Lenell Cooky Co.," a throwback to its origins: Hans and Gunnar Lenell. who opened the Lenell Bakery in 1925, and then joined with friend Agaard Billing in 1937 to start the company at 3352 N. Milwaukee. The company moved to West Belmont Avenue in 1940 and built the last Harlem Avenue plant in 1956 (okay, not in Chicago, but Norridge. Close enough for baseball). Speaking of lucky boys, I toured the Harlem factory, though it took some doing. As a card-carrying member of the Division Street Russian Baths, I would take the heat, and one of the sweaty Jewish guys on the bench with me was Wayne Cohen, whose father Sonny bought the company in 1987. He was reluctant to let me visit. Why? I wondered. The machine, he said, for making pinwheels is proprietary. He worried their competitors would learn their secrets. "How about this," I suggested. "You don't show me the machine that makes the pinwheels. And I'll promise not to say anything about how pinwheels are made. So between your not showing it to me and my not writing anything about it, the secret will be safe." That worked. So I got to walk through the plant, which closed when Lenell went bankrupt in 2008. Passing happily through pools of aroma, puffs of almond, of sugary sweetness. If you like pinwheels from a box, imagine eating one hot off the production line. Bliss. For years afterward, at Christmas, Lenell would dispatch a four-pound drum of cookies, sometimes several drums which, ethical journalist I am, I would either set out in the newsroom or convey to the local firehouse. It made a grand procession down Halsted Street, me, holding the big drum, two eager boys skipping along after, on our way to make firemen happy. People are rushing to buy up the dwindling stock, but they're just postponing the inevitable. It's sorta sad, spinning the dials of your safe, pulling out that last stack of pinwheels, laying on a chaise in a dimmed room and slowly bringing it to your lips, weeping. I've reached the point where I let stuff go. It's the Willis Tower now. Deal with it. If you love Maurice Lenell Cookies, you've already had better memories of them than you'll get by fetishizing the last ones made by some company in Ohio. Better to end with one last Maurice Lenell memory. Then we'll sweep the crumbs into the dust pan of history. There was a huge old furnace in the basement of our building at Pine Grove, some 1920s relic too big to remove. I always told the boys that a monster lived there. Now and then I'd suggest we go down and feed the monster in the basement. I can see us, one boy gingerly holding a paper plate containing a couple of Lenell cookies--not all those tins got to the firemen. A boy would timidly set it down, and as they'd bolt for safety, I would sky the cookies off the plate, jam them into my mouth, and follow. We'd assemble just outside the furnace room. "Go back," I'd whisper. "And see if the monster ate the cookies." The younger one cautiously peeked through the doorway, at the bare white plate set before the furnace. Now Maurice Lenell is gone too. But they were here, once, and that's the important thing. Funny how people rush out to empty the shelves when an iconic item is being discontinued. I confess I made the rounds myself, driving to a few nearby stores, seeking the lovely pinwheels, but to no avail, alas. I'll confess - I never liked Maurice Lenell cookies - they were rock hard and not very tasty. Then again, I grew up near Andersonville, and the bakeries! There were six of them within three blocks of my house, and they were all fantastic. me, too, Peter. too dry and crumbly. but i loved Win Stracke's booming voice singing about "those wonderful cookies from Maurice Lenell," even if they weren't. It's not as pressing as when many went crazy over the Twinkies temporary ending. Never saw what was so great about them. That's two of us. Airy spongy nothings. Now SNO-BALLS, however .... those were fantastic. Ding-Dongs were my Hostess favorite, but they don't taste as good now that they're made by union busters. Maybe that was one of the reasons that production of Maurice Lenell was moved to Ohio? "Close enough for baseball" is a good one. I assume you were alluding to the teams whose stadiums are actually outside the city limits. But I was waiting for an allusion to Proust's madeleine, which I finally tasted at the Drake, forever to evoke moments of helpless out-of-placeness. I've had madeleine's in France and England. All somewhat different tasting although baked in the same shaped mold. All considerably superior to what Lenell had on offer. Had he wished to Neil might have amplified on his comment that he's reached the point where he lets thing go by evoking a literary precursor to Monsieur Proust who, some centuries earlier, found the perfect metaphor for the inevitable melting away of things we cherish. Writing not about cookies but famous women, François Villon asked after each verse of his "Ballad of the Ladies of Times Past," "Where are the snows of yesteryear?" Thanks, Tom, for the "Ballade." I looked it up and listened to it set to music. Enchanting! Compared to my grandmother's homemade cookies of similar design, Lenell's taste like sawdust. I won't miss them at all. I wasn't a huge fan of them. They all tasted like compacted sugar. But sometimes that's a good thing. 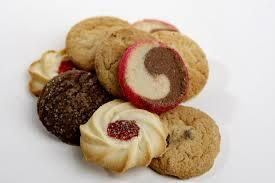 Growing up in Elmwood Park I can remember Saturday morning trips down to Lenells to get cookies, and standing mesmerized nose stuck to the glass watching the conveyor belt carry those cookies round and round.....and the heavenly scent which could be enjoyed for blocks! I can still hear my mom saying "they're cooking today!" My dad used to talk about hot cookies or crackers right off the conveyor belt at Nabisco on Kedzie. Good thing he never became overweight or diabetic, but he was never hungry for dinner when he got home. He always came home with treats. In the blizzard of '67 when he was trapped there for 2 days, no one went hungry. That wouldn't be the same plant where Mondelez (the current owner) is laying off 600 people, would it? Edit to above: Yes, it is. Good thing your dad retired when he did. Yes, that is the one. They prefer to ship some jobs out now. He retired early in 1989. During the later Nam war years the overtime was nonstop due to a gov't contract they had with cookie packets provisions for the soldiers. I think the descriptions of the Lenell cookies, by both Neil and the commenters, are pretty accurate. To me, Lenell is a classic victim of middle-of-the-road syndrome: Not bad enough to be really cheap, and not good enough to be gourmet.